This version of AM-BOSS commercial series pull-down access ladder has been rated at 400kgs and is manufactured with 100mm stiles and treads. 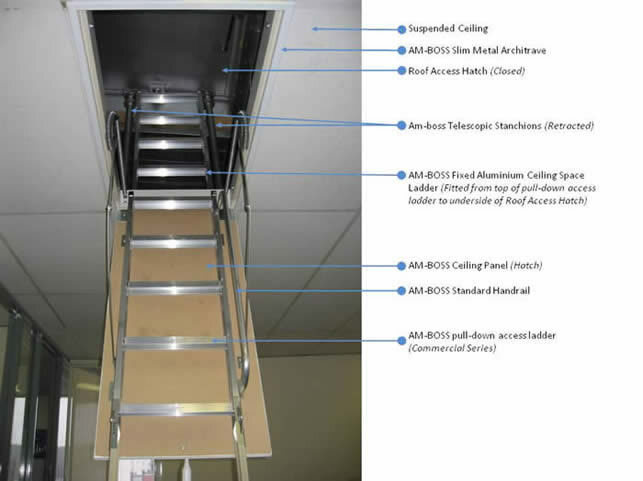 AM-BOSS Access Ladders Pty Ltd designed and manufactured our latest addition, THE AM-BOSS 'INFERNO-BOSS'™ commercial series access ladder. The AM-BOSS Inferno-Boss™ has been tested and fire-rated to AS1530.4-2005 at 90/90. This model will accommodate ceiling heights up to 3000mm. It is manufactured on grade at 68° approx., with 400mm wide treads and comes with a Standard Handrail. Ceiling cutout 1290mm x 645mm. Note: Clear inside dimensions 1165mm x 455mm.